Take a beer adventure to remember at the 2018 Hops on the Mon Craft Beer and Food Festival! This is your chance to sample from more than 175 different offerings from 70-plus local, regional, national, and international breweries in the indoor comfort of the Ruby Community Center at Mylan Park. The 40,000 square foot Expo Center is the perfect setting to savor the best local, American, and European craft beer available—all rigorously selected based on product quality and style distinctiveness. And while you’re here, try a tasty treat and cast your vote to help us determine the winner of our Motown Taco Throwdown presented by Apex Chiropractic & Physical Therapy, and make your choice for best brewery and the recipient of our coveted Hops Cup for 2018. So be a part of the largest gathering of all things beer held in West Virginia. Two ticket levels available … general admission and VIP. Both receive a commemorative glass. Over 70 breweries to choose from! Sample the best beer from your region and from around the world! 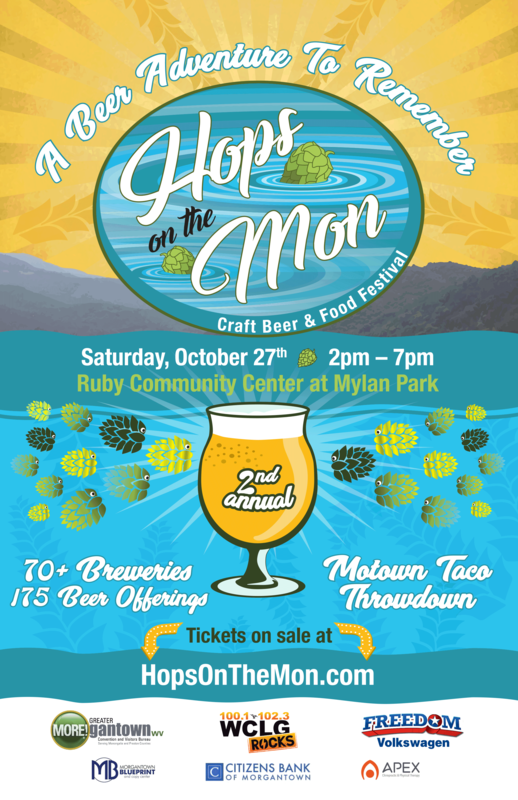 Hops on the Mon will take place on Saturday, October 27 from 2pm – 7pm at the Ruby Community Center at Mylan Park, 111 Mylan Park Lane, Morgantown, WV 26501. Hops on the Mon thanks the following sponsors, without whom, this event would not be possible. Please support our generous sponsors today and in the future. See the official 2018 poster! Hops On The Mon Craft Beer & Food Festival aims to elevate the standard in beer. Each brewery has been carefully selected with only you in mind. We want you to have the best-tasting beer experience possible by offering you the best of West Virginia, the United States and the world! No large event operates well without committed and hard-working volunteers and Hops on the Mon is no different. We’re seeking special people with an interest or passion for craft beer and food to join our team and help us stage a successful event. As a volunteer, you’ll work Friday, October 26, or Saturday, October 27. In return, you’ll receive free admission to the event, a free event t-shirt, and the opportunity to attend a special volunteers-only party complete with food and drinks. Plus, you’ll have some fun! So, simply click the link to volunteer for Hops on the Mon today. Hey, Hops on the Mon isn’t just about beer. Each year we’ll have a different food competition based on a theme, with the winner decided by you! This year’s theme is tacos and the Motown Taco Throwdown presented by Apex Chiropractic & Physical Therapy promises to be a battle as eight of the area’s best restaurants put their creativity to the test for the top spot and bragging rights until next year. As a Hops on the Mon attendee you’ll have a chance to purchase samples from each competing restaurant and then cast your vote for the people’s choice award that goes to the winner, along with a $1,000 grand prize! Please note that all purchases on the day of the event will be cash only, so remember to come with real money to spend on tickets, food and merchandise. Stop by our merchandise booth and get your official Hops on the Mon t-shirt for just $20 when you attend this year’s festival. Show you were here and remember, cash only please! Hops on the Mon is proud to partner with Friends of Deckers Creek as our community partner for this year’s festival. We’re excited to join in their mission to improve the natural qualities of, increase the public concern for, and promote the enjoyment of the Deckers Creek Watershed. A portion of the proceeds from Hops on the Mon 2018 will go towards the important work being done by Friends of Deckers Creek. You can find more information about Friends of Deckers Creek at deckerscreek.org. Click the link above to buy your tickets online! Hops on the Mon is a beer sampling—not a beer drinking—event. With the large number of beers available no attendee will be allowed, nor should expect, to sample more than a limited number of beers over the course of the event. Be aware that cash will be required for ticket, food, and other purchases during the event. Please come prepared. An ATM is available in the front lobby of the Expo Center but should not be considered a reliable source of funds. Hops on the Mon is produced and managed by Top Tier Beer Group LLC. Hops on the Mon reserves the right to refuse admission, remove, or request law enforcement custody, for any attendee who is visibly intoxicated, aggressive, or detrimental to the enjoyment of the event. No refunds will be issued in this case. Ample free parking is available for all attendees at Hops on the Mon. Attendees are strongly encouraged to get a ride to and from the venue and leave your vehicle at home. The use of taxi and ride-sharing services is encouraged for all attendees at Hops on the Mon. A taxi and ride-sharing station will be set up at the entrance to the Ruby Community Center. Please utilize this service as necessary. We strongly discourage drinking and driving. Play it smart, designate a driver who does not drink, or get a ride for your safety and the safety of others. Designated drivers attending the event are encouraged to volunteer and save the cost of admission. Please follow the volunteer link. Take a free shuttle to Hops on the Mon and leave your car at home! 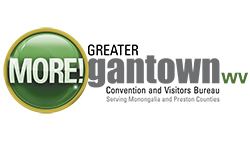 A shuttle bus will be operating from 1:00 p.m. until 7:30 p.m. from the Courthouse Square on High Street, leaving and returning approximately every half hour. © 2018 Hops On The Mon • Top Tier Beer Group, LLC.